I’m a sucker for anything featuring Elvis and there’s no denying that the title for Heather Colbert’s Mark Nevin music video definitely grabbed my attention. 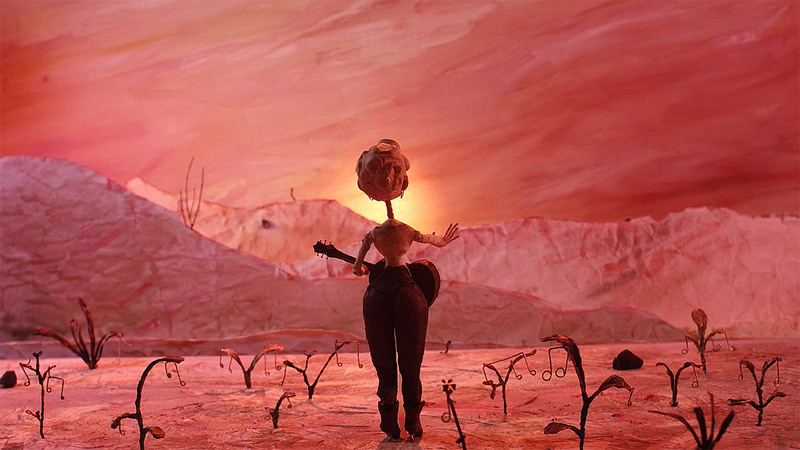 A reimagining of the true story of when Dolly Parton refused to part with her song I Will Always Love You when Colonel Tom Parker wanted to take 50% of the royalties if Elvis recorded it, this visually appealing video features some stunning puppet work and inventive filmmaking. Joining us to discuss the positives and negatives of making a music video from a true story and the attractions of stop-motion, Heather gives us a behind-the-scenes look at her latest animation. How did the opportunity to make this music video arise? It was actually through Joseph Wallace. Mark Nevin approached him after seeing his incredible video for Sparks (Edith Piaf Said It Better Than Me). I had helped with sets on Edith Piaf, in the middle of my first music video, and I think Joseph was focusing on his new short film, so he kindly suggested I pitch for it. Mark was happy with my interpretation and so we got cracking! Visually the video is based around the lyrics of the song, did you find this a positive or negative influence on your creativity throughout production? Initially, the true story narrative did seem like a limitation. However, I felt the strength of Mark’s song came from the fact that it was based on real events, and it would be counterproductive if I veered away from this too much. Sketching while I listened to it repeatedly, I saw another layer in how the balance of power between the two characters gradually shifts through the song. There was a clear and steady growth in Dolly’s character from sort of ‘Disney’ levels of naivety, eventually transforming into a woman totally in control, telling the Colonel ‘where he could…’. As Dolly grows, the Colonel’s blustering and bullying crumbles under the strength of her confidence and self-belief. I found these arcs very interesting to play with. When we had agreed on using the metaphor of size to stand for confidence, it became an interesting physical problem to solve. I had so many ideas of how you could make a puppet grow and shrink in stop motion, including some rather ‘blue sky’ ideas involving extending arms and legs, or inflating/stuffing the puppet! But most solutions were not possible on the budget and time scale I had. So I had to think of ways to imply the transition off camera, and then increase the effect with the camera angles, as well as using different scales of props and scenery. The video stars some great puppets of Dolly Parton and Colonel Tom Parker, how did you go about creating these and did you base them on real images? Thank you! Yes, they are very striking people to capture, so the character design for this project was brilliant fun! I came to animation through illustration, so I think the detail and essence of a character is where my brain goes at this stage. After gathering a selection of photographs of each of them from around that time (1973), I started by spending time with the characters in my sketchbook. Drawing them repeatedly usually helps highlight the features that will be most important in identifying Dolly as Dolly, for example. For the Colonel it became his portly frame, ‘Stetson’ hat and fat cigar. For Dolly it became her hourglass figure, heart-shaped face and that extravagant hair do! I played with these features in my sketchbook, and with test puppets, simplifying them until the final versions emerged. For me, the most joyful part of animating a human character is in the hand movements. I wanted to explore the tactile aspect of this type of animation, as this is the part of stop motion that I most connect with. I experimented with lots of different paper, fabric and card to find the best mix of textures for this world. For me, the most joyful part of animating a human character is in the hand movements. I wanted to make very dexterous hands, giving the Dolly puppet especially delicate digits! We noticed friend of Directors Notes Joseph Wallace listed as ‘Mentor’ on the production – how was his experience in the medium useful in helping you reach your end goal? As well as connecting me with this project in the first place, Joseph and also my friend, Roos Mattaar, were so generous with their advice and experience. There are technical things I missed out on – not coming through a film school or a filmmaking background – so they answered any questions I had to do with issues like flicker and editing file formats. But on top of this technical help, one of the reasons I was so grateful to Joseph in this project was for the confidence in my work that I gained from spending time working for him on the Edith Piaf video, and then attending the intensive workshop he ran with Péter Vácz in Budapest (as part of Primanima Festival 2017). I was introduced to a different way of working; the concept of ‘lensing up’ and a wider range of art forms as inspiration. Can you tell us a little bit about what attracted you to stop-motion, what training/education do you have and any plans for future projects? I think growing up on a diet of The Clangers and Bagpuss might have something to do with my fascination with stop motion. I always loved watching how the beautiful textures, with their natural imperfections, moved. I had tried making animations inspired by Terry Gilliam and radio comedy during school and my foundation course in Bristol, but it wasn’t until my illustration and animation degree at Anglia Ruskin University that I really gave stop motion a proper try. As well as discovering Joseph’s and Péter’s work online, I watched The Maker by Zealous Creative in my 2nd year, and realised how beautifully you can create a new universe with stop motion animation. Unfortunately, the course was not really set up for stop motion, so, like many young creatives, I learned as much as I could from online tutorials in order to make my graduation film. I think the workshop in Budapest is the most transformative education I have had so far in animation. It introduced me to new concepts and disciplines, and gave me the confidence to go for the Dolly project. Having made my last three animations alone, It will be really exciting to work as part of a team again! At the moment I am working as a student supervisor in the animation department at Anglia Ruskin University, Cambridge. I know that when I have led workshops in the past, with my illustration hat on, my skills and knowledge have been cemented by sharing them with others. So I think this will be useful to me and my practice, as well as hopefully being helpful to the students interested in stop motion! I am also working with a brilliant Spanish filmmaker I met at the Primavera workshop, Abel Carbajal, who is making his graduation film at ESCAC (near Barcelona). I have been designing the character for his film (a magician); in March I will travel to ESCAC and be part of the puppet making process. Having made my last three animations alone it will be really exciting to work as part of a team again! I am also pitching a few animation ideas to people I would love to work with. We shall see!